This collection would prove useful in a huge amount of scenes and projects, from everyday scenes to fantasy images to themed architectural visualizations and, of course, more specific scenes from around the world. 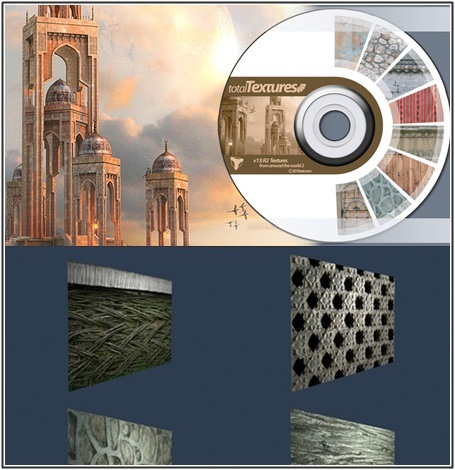 This DVD contains 218 individual materials, comprising of over 670 individual, hand-crafted texture maps. Every texture has its own unique colour map, bump map and specular maps. Due to the size of this collection, the textures have been split over two volumes. For details of what textures the first volume contains, please look at Total Textures V12:R2 – “Textures from around the World 1″.